New North Carolina coach Mack Brown says returning for a second stint with the Tar Heels is the right fit for him. The school officially announced the move Tuesday morning, saying they had signed him to a five-year deal that pays him $3.5 million annually. Brown spent 10 seasons at UNC from 1988-97 before leaving for Texas. He left there in 2013 and has been in broadcasting in the years since. Brown says he’s “so excited about starting over with young people I don’t know,” though he said he watched plenty of UNC games last season while working at ESPN. He says he plans to meet with the players after his news conference. North Carolina has agreed to a five-year deal with Mack Brown that will pay him $3.5 million annually in his second stint with the Tar Heels. The school released terms of the deal shortly before its news conference with Brown, athletic director Bubba Cunningham and chancellor Carol Folt. The deal includes a base salary of $750,000 and supplemental compensation of $2 million a year. There’s an additional $200,000 per year tied to apparel maker Nike and $500,000 annually with Learfield for multimedia obligations. Brown will also receive $50,000 annually for expenses. 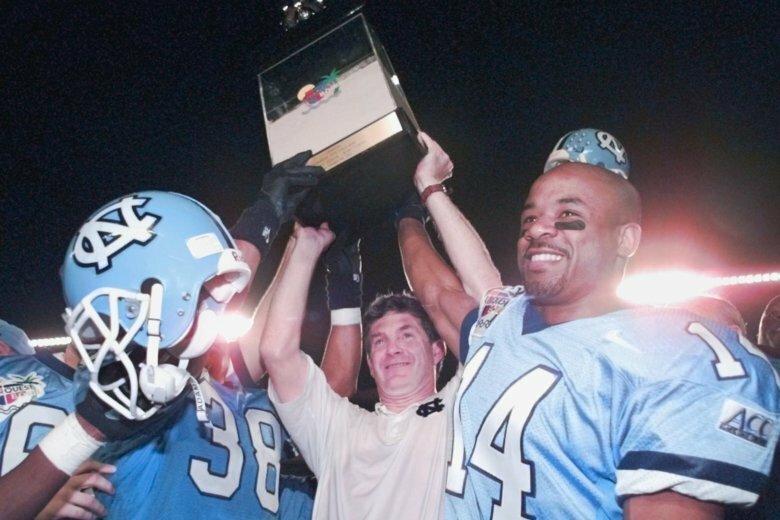 Mack Brown is North Carolina’s new football coach in a second stint with the Tar Heels. The school officially announced the move in a news release Tuesday morning. Financial and contract terms were not immediately available, though the school has scheduled a news conference for later Tuesday with Brown, athletic director Bubba Cunningham and Chancellor Carol Folt. Brown replaces Larry Fedora, who was fired Sunday after seven seasons. The 67-year-old Brown coached the Tar Heels from 1988-97, with his last two teams finishing in the top 10 nationally. He went on to spend 16 seasons at Texas, where he won the national championship for 2005. Brown left Texas in 2013 and has been working in broadcasting in recent years.